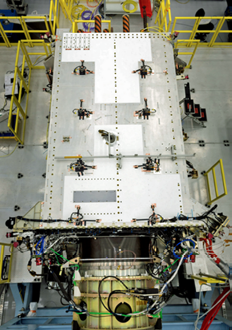 In a specialized cleanroom designed to streamline satellite production, Lockheed Martin (NYSE: LMT) is in full production building GPS III — the world’s most powerful GPS satellites. First photo of the GPS III Space Vehicle #2, now fullyintegrated. Photo is courtesy of Lockheed Martin. In May of this year, the U.S. Air Force’s second GPS III satellite was fully assembled and entered into Space Vehicle (SV) single line flow when Lockheed Martin technicians successfully integrated its system module, propulsion core and antenna deck. GPS III SV02 smoothly came together through a series of carefully-orchestrated manufacturing maneuvers utilizing a 10-ton crane. GPS III SV02 is part of the Air Force’s next-generation of GPS satellites, which have three times better accuracy and up to eight times improved anti-jamming capabilities. Spacecraft life will extend to 15 years, 25 percent longer than the newest GPS satellites on-orbit today. According to Mark Stewart, VP of Navigation Systems for Lockheed Martin, GPS III SV02 will begin environmental testing this summer to ensure the satellite is ready for the rigors of space. This testing simulates harsh launch and space environments the satellite will endure, and further reduces any risk prior to it being available for launch in 2018. Directly following GPS III SV02, eight more contracted GPS III satellites are moving through production flow at Lockheed Martin’s nearly 40,000 sq. ft., state-of-the-art GPS III Processing Facility near Denver. The GPS III team is led by the Global Positioning Systems Directorate at the U.S. Air Force Space and Missile Systems, Center. Air Force Space Command’s 2nd Space Operations Squadron (2SOPS), based at Schriever Air Force Base, Colorado, manages and operates the GPS constellation for both civil and military users. Stewart added that from day one, GPS III has been a team effort and Lockheed Martin’s successes would not have been possible without a strong Air Force partnership. GPS III will ensure the U.S. maintains the gold standard for positioning, navigation and timing. 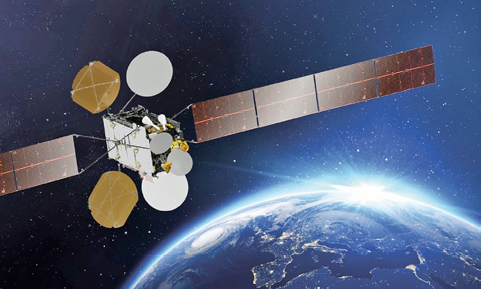 Inmarsat has confirmed the successful launch of their S-band satellite (Inmarsat S EAN) for the European Aviation Network (EAN). The launch is a key milestone for Inmarsat’s unique EAN service, which is on course to commence commercial service in the second half of 2017. The Inmarsat S-band satellite, built by France’s Thales Alenia Space, was launched on an Ariane 5 rocket by Arianespace at 22:15 BST/17:15 EDT from Kourou in French Guiana. Following satellite separation, telemetry from the satellite was acquired by Inmarsat’s Mingenew Ground Station in Western Australia. Inmarsat’s EAN is the world’s first dedicated aviation connectivity solution to integrate space-based and ground-based networks to deliver a seamless WiFi experience for airline passengers throughout Europe. International Airlines Group (IAG), which includes world renowned airline brands such as British Airways, Iberia, Aer Lingus and Vueling, is confirmed as the launch customer for the new service. 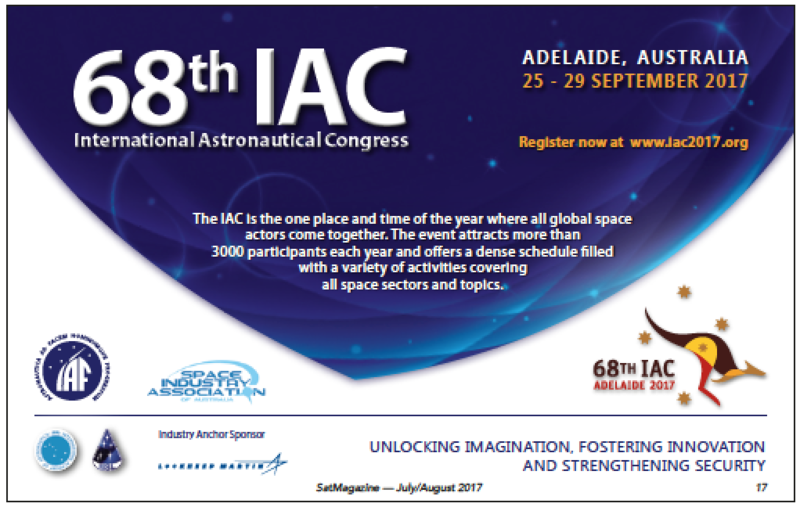 IAG has begun equipping its aircraft and aims to have 90 percent of its short haul fleet complete by early 2019. 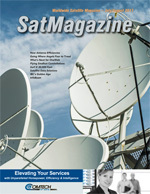 The successful launch of the S-band satellite underlines the momentum that Inmarsat is building in the high-speed broadband inflight connectivity (IFC) market, which Inmarsat entered in October 2016 with the commercial introduction of GX Aviation, a worldwide service powered by its Ka-band, Global Xpress satellite constellation. Inmarsat now has more than 1,200 aircraft installations expected under signed contracts for its IFC services. Mandates have been won from leading airlines worldwide including Avianca, Qatar Airways, Deutsche Lufthansa Group, International Airlines Group, Air New Zealand, Singapore Airlines and Norwegian Air Shuttle. “The successful launch of Inmarsat’s S-band satellite means that the start of our revolutionary European Aviation Network is now just months away,” said Rupert Pearce, CEO, Inmarsat. “We first announced our plans for EAN in 2014, seeking to take advantage of a visionary and unique commercial and technological opportunity created by the European Commission’s DG CONNECT and then supported by Member State telecoms regulators. 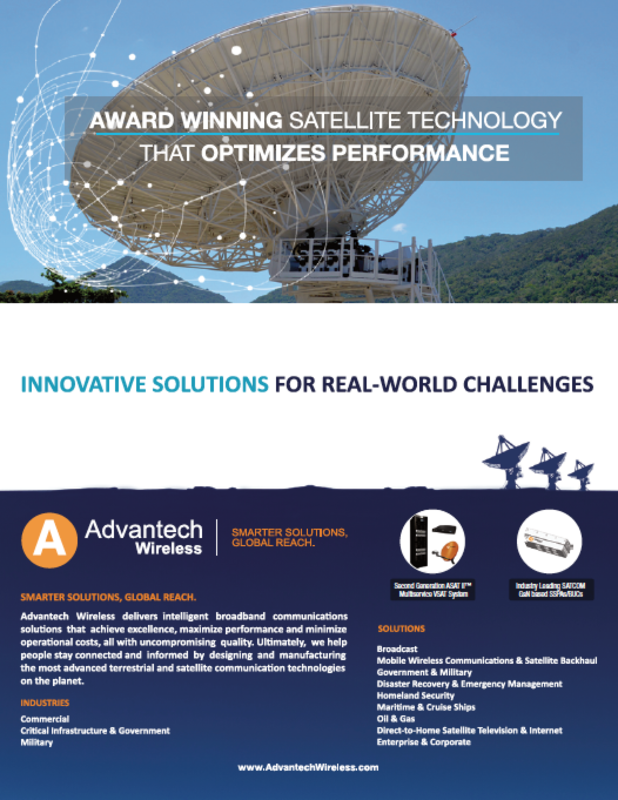 “This is a testament to the continued support of European Institutions and national regulatory authorities, the hard work of multiple teams across Inmarsat and the commitment of our vital strategic partners, including Deutsche Telekom, Thales Alenia Space, Thales Aviation, Cobham and Arianespace, that we now stand on the threshold of a new aviation WiFi service that will transform the experience of passengers flying throughout Europe. Vector is a self-described disruptor — the company connects space startups and innovators with access to space that is, according to the firm, affordable and reliable. Vector’s vision is to reshape the multi-billion launch market and to combine dedicated, lower-cost launches for smallsats as well as for software defined satellites (Galactic Sky) to dramatically increase access and speed to orbit. The company has just received an infusion of capital from the Silicon Valley VC firm, Sequoia Capital, to the tune of $21 million. Formerly, in April, Vector had bagged some $4.5 million in a bridge round that was used to float the firm until they could complete their Series A financing. In addition, Vector was awarded a Small Business Innovation Research award from NASA and DARPA, along with $2.5 million just prior to their bridge round. The Vector launch vehicle family consists of the Vector R (Rapid) and the Vector H (Heavy) launchers. The Vector R places 50 kg into orbit and is the company’s basic, first use capability. The Vector-H places 100 kg into orbit and is a block upgrade to the Vector-R. On May 3 of this year, the company’s prototype Vector-R launch vehicle was successfully launched from the Mojave Desert in California. The two launch vehicles share common technology and launch facilities that include pressure fed ablative engines, carbon fiber fuselage, LOX/Propylene fuels and mobile launch capability. According to the firm, their launchers are the only launch systems that are dedicated to smallsats and will allow for satellite launches whenever and wherever needed. 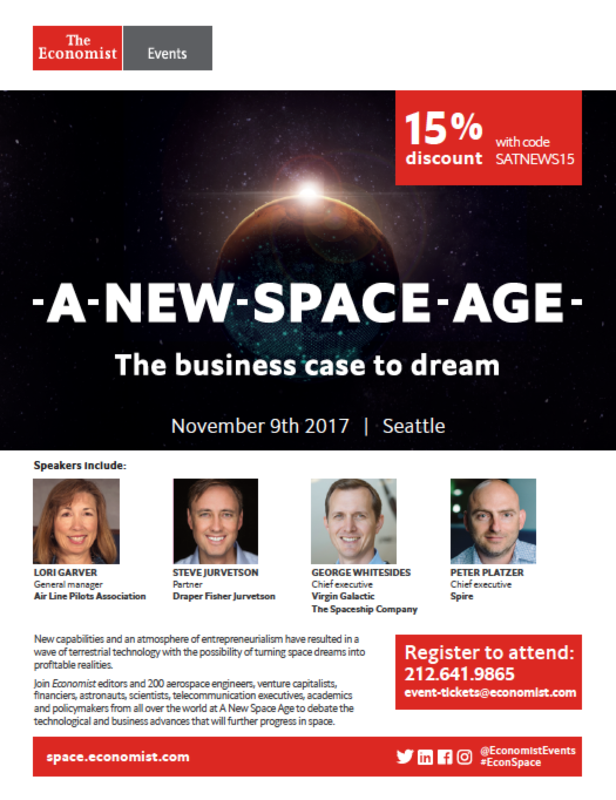 The firm’s Galactic Sky division transforms the space segment from the current hardware centric state to a much simpler software development proposition with software defined satellites. Vector’s ultimate vision is one where space app developers will be able to develop satellite applications on their desktops and then upload that data to an at-the-ready satellite constellation for nearly instant data and revenue receptions.